Premier UK Online Garden Centre. 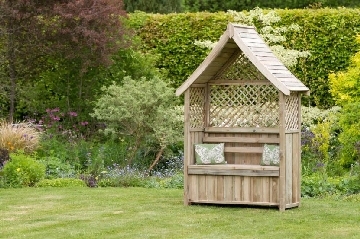 Garden Buildings,Furniture & Garden Lifestyle Products.The official site for the Heritage Gardens Brand. 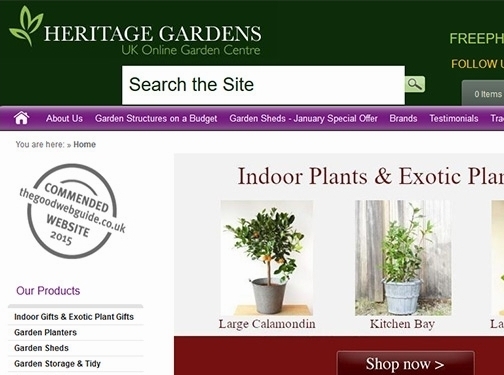 HERITAGE GARDENS UK ONLINE GARDEN CENTRE IS A GARDEN BUILDINGS & FURNITURE SPECIALIST. HIGHLY COMMENDED IN THE GOOD WEB GUIDE WEBSITE OF THE YEAR 2015. At Heritage Gardens we offer a comprehensive range of garden buildings and furniture, indoor home furniture, garden and indoor games, art and garden ornaments,gardening accessories, plants and gifts as well as many other products all carefully chosen to provide our customers with value for money, quality and great style. We also have a specialist Trade Sales Department for garden designers and landscapers, hotels, pubs and holiday complexes, residential care homes and many other similar businesses where garden related products are required. Discounts are usually available for volume orders. Our Team is committed to providing our Customers with the best possible service. Customers are welcome to phone us on our FREEPHONE number 0800 694 1841 to discuss any aspect of a potential purchase and a member of our small but dedicated Team will be please to help. You may be invited to leave a voicemail message but rest assured, your message will be responded to on the same day if possible weekends included. You will not have to listen to music while waiting or press any buttons to get through ! Alternatively, you can email me at gilbert@heritagegardens.co.uk with your enquiry. Every order is important to us and if your Enquiry/0rder is urgent you can phone our mobile on 07770 989897. The Heritage Gardens Trade Sales Department supplies many different types of businesses and organisations with their Landscaping requirements. Our Trade Customers include Hotels, Housing Associations, Retirement & Care Homes & Pubs and Leisure complexes who are looking to add the finishing touches to their developments with products such as wooden planters, solid teak or oak benches, Bistro Sets & other configurations of tables & chairs. We have a wide choice of secure storage solutions in wood, plastic & metal. We also supply various National Trust properties & educational establishments throughout the UK. 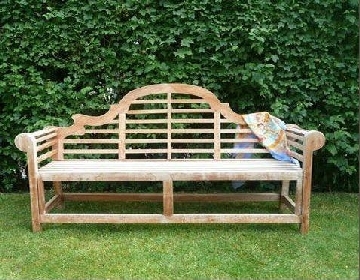 Heritage Gardens is a media recommended UK online only retailer & a Garden Buildings & Furniture Specialist. We are also an Authorised Supplier to the National Trust & Highly Commended in The Good Web Guide. 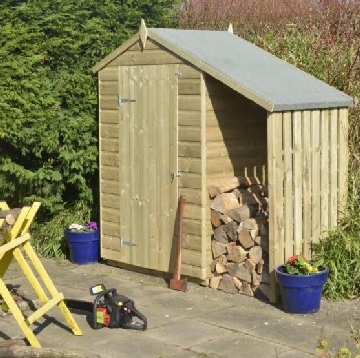 We also sell a comprehensive range of arbours, gazebos & planters as well as Sheds, Summerhouses, Garden Offices & Cabins from leading UK manufacturers. A good choice of Solid Teak, All Weather Rattan & Aluminium Garden Furniture is always available & can be delivered promptly to anywhere in the UK. Our Contract patio furniture is also popular & both budget & high end ranges are supplied. HERITAGE GARDENS WAS HIGHLY COMMENDED IN THE GOOD WEB GUIDE WEBSITE OF THE YEAR AWARDS 2015. Rothschild Foundation, Waddesdon Estate, Buckinghamshire. All Trade Customers are looked after and products sourced if necessary with delivery arranged to the Client's site, often at short notice. Our Trade Customers can count on the following: 1. Personal, prompt service from the Heritage Trade Team with closely monitored follow up of Orders through to their completion upon delivery. 2. No obligation Product Sourcing service. Prompt call back to advise on outcome of search. 3. E mailed price quotation to confirm availability & estimated delivery date. 4. Discounts available dependent on product and quantity ordered. 5. FREEPHONE 0800 694 1841 to place the Order or discuss your requirements. Pubs, Leisure outlets and holiday cottage complexes can choose from our extensive range of Garden Games for both adults and children for use in their amenity and leisure areas. Wedding organisers also find our games useful for entertaining guests at the Reception as they are easily transportable after the event. Croquet sets make a charming addition to the gardens of holiday cottages and are popular with all ages. We also have a comprehensive range of chimeneas & fire baskets to enhance the atmosphere and encourage alfresco dining. 1. Personal, prompt service from the Heritage Trade Team with closely monitored follow up of Orders through to their completion upon delivery. 2. FREEPHONE 0800 694 1841 to place the Order or discuss your requirements. 3. Discounts available dependent on product and quantity ordered. 4. No obligation Product Sourcing service. Prompt call back to advise on outcome of search. 5. E mailed price quotation to confirm availability & estimated delivery date. A/c Name : Daison Estates Ltd. A/c No 85817960 Sort Code : 30 80 37 Lloyds TSB, 234 High Street, Exeter, EX4 3NL. UK (Newton Abbot , Devon) based business - established in 1923 - providing garden buildings, furniture and other gardending products. Website includes e-commerce facilities, delivery and returns information, client list, details of awards won, associations, testimonials, full contact details including company registration number.